Android slates are available in almost every screen diagonal under the sun, and LG had plenty of targets to aim for, planning their return to the tablet game. An 8.3-inch display looks like the right choice, considering how the scene has changed in the Koreans' absence, more than two years now since their first Optimus tablet. Compact tablets have become the popular choice, propelled by the success of the Nexus line, while ten-inchers have been struggling to cope with the iPad pressure. On the other hand, Apple too must've felt compelled to respond to the expansion of compact Android tablets, hence the iPad mini, which has a screen diagonal of 7.9 inches sharp. It must be part of the reason too why LG went for 8.3 inches, which is the largest diagonal that can still fit in one hand according to its test. The G Pad's display is of WUXGA (1920 x 1200) resolution, for a 16:10 screen aspect ratio. What this means is wider viewing area than traditional 1080p screens, which is more comfortable for reading and web browsing, the flipside being unused screen space when watching video. 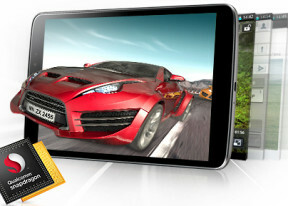 The G Pad is powered by a quad-core 1.7GHz Snapdragon 600 processor with Krait 300 cores - the same combo ticking inside the Optimus G Pro phablet. The device also integrates into your living room multimedia setup, as there's an IR-port up top for operating HDTV's and set-top boxes, and the integrated QRemote app lets you customize settings for different room locations as well. 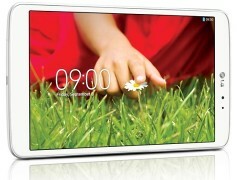 LG has put a 5MP primary camera on the G Pad, which may not sound like much, but it is a tablet after all. Unfortunately, there are a few prominent features missing, such as NFC connectivity and voice call support. Those are all pretty minor shortcomings for a tablet, too, so we doubt anyone will lose interest because of them. A few other missing pieces when compared with the G Pro include HDR video recording, Dolby Mobile sound enhancement, and most notably the Dual Screen Dual Play ability, which lets you stream content to your TV screen wirelessly or through the MHL port onto a larger display while simultaneously using the screen on the G Pad for something else. But the argument must've been that what can be done on a phablet isn't necessarily going to be comfortable or useful on a bigger scale. And the G Pad looks like a solid tablet with good in-hand feel thanks its relatively low for the size 338 grams of weight. The phablet has a 4,600 battery, which is lower than what you'd find on LG's last tablet but on par with some of the main competitors. We're curious to see how this translates into real usage, and will be sure to test that extensively as we go on. Up next, we get things under way with our traditional hardware checkup. People complaing bout poor camera quality? well i don't care about the camera on a tablet. who takes pics with a tablet anyway....thats stupid.